A natural contact insecticide that works by causing abrasions on insects as they come in contact with product, resulting in loss of body fluids, then dehydration. Digestible by Earthworms, thus causing them no harm. Very effective in controlling Snails and Slugs in bedding plant areas and around houses. 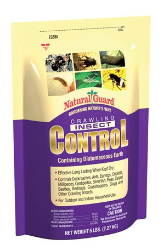 Cockroaches, Ants, Earwigs, Snails, Slugs and other listed crawling insects. Use hand duster or bulbous duster to apply light coating of dust to areas where crawling pests are found or may hide.